Attempting to describe the plot of a Godfrey Ho film is very much like playing a game of Jenga, so hopefully this can happen without anything falling to pieces...apparently an old lady’s late husband left her a lucrative gem mine. “Rebels” in the area want to take control of the mine, so an agent named Chester takes a job there to go undercover and get information about said rebels, which are led by a man named Michael. These baddies are terrorizing villagers near the Thailand border, so an American Captain named Byron (who is “The Best”, naturally) attempts to take control of the situation. He has history with Michael due to their military service, but Michael defected to the baddies. Then the ninjas come parading in, led by a White guy named Harold, who has a compound where he trains his fellows in the Ninja arts. Harold wants control of a gem mine run by a girl named Julie, and there is a group known as the Black Knights who also want gem mine money - all leading up to ninjas flipping around in the air for a while. What the heck is going on? 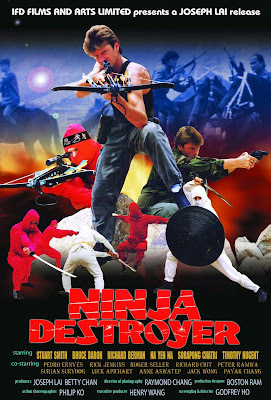 Godfrey Ho nuttiness abounds with yet another ridiculous, silly, nonsensical, but not un-worthwhile VHS ninja fest. If you’re familiar with his work, this is very much in keeping with the rest of his catalogue. If you’re not, expect to be confused, but reasonably entertained. Many of Ho’s trademarks are present and accounted for: loud dubbing from people with implacable, quasi-British-but-not-really-sounding accents, White guys in strange “ninja” outfits, fast, gravity-defying choreography, many scenes in forests, the time-honored headband that says “ninja” on it, the stop-on-a-dime ending, and of course the Final Field Fight. But while the trademarks are here, it’s certainly not a case of “seen one, seen ‘em all”, because there are always new things Mr. Ho is throwing at our faces. This time around, it’s an almost Phantom Soldiers (1987)-style raid on a village, with many exploding huts and guard-tower falls (you gotta feel sorry for those guys in the guard towers - they must know they’re going to come flailing down from their post at some point). Of course, a scene like this wouldn’t be complete without at least one guy screaming while shooting his machine gun. Also there are a lot more horses in this scene, and later on, than in other Ho movies. Another difference comes during the aforementioned FFF, where graffiti is seen on a wall saying “Body Rock” and “Break”. While Breakin’ (1984) is an integral part of ninja tradition, it’s fascinating to think Godfrey Ho and his compatriots were watching Chilly D do his thang and that it was a possible influence. We would love to see a Ho-directed dance movie from the 80’s. There’s someone listed in the credits whose name is Boston Ram. This is an actual person’s name. A tip to any potential parents with the last name Ram: Boston makes a great first name for either a boy or a girl. Anyway, Ninja Destroyer is a broken pinata of scenes of mindless shooting, an impenetrable plotline, and what we’re all here to see, highly absurd ninja action. 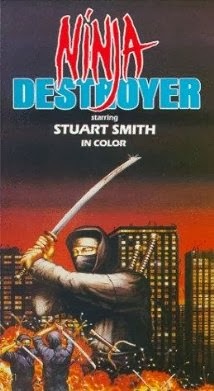 If this mixture appeals to you, by all means seek out Ninja Destroyer.